This simple worksheet has two reading passages, similar to what students may see on state standardized science tests. Students read a short description of a science experiment and must answer questions related to science methodology, such as identifying controls and variables and summarizing conclusions that can be drawn from the text. The two stories are based on real examples of science being used to solve problems. 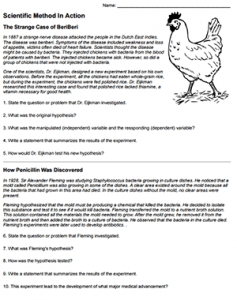 The first case outlines an experiment that was used to determine how chickens were developing a disease caused beriberi, a disease humans can also develop and is the result of a vitamin deficiency. The second case describes how Alexander Fleming discovered that the mold penicillium would kill bacteria.